Some call him Quirky, few call him handsome but for me he is Lively, Dashing and Full of Life. With his Bold, Boisterousness and Fearless—“ I don’t give a damm attitude”. We bet Ranveer Singh never goes unnoticed, You may love him or hate him but can’t IGNORE him. 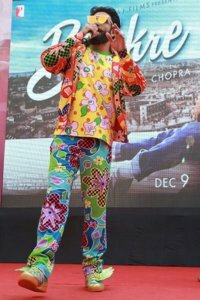 Ranveer Singh is just bewildering & funky with his styling too!! 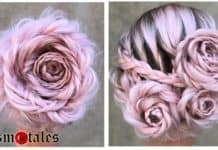 Number 3, 6 and 16 are my favorites, while dont forget to check 17 & 18 Bizarre. This Jack and Jones India shoot featuring an estrange Ranveer Singh is just magnetic. He once said- “200 characters live inside my head and they just pop out”. 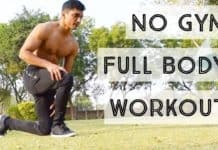 Looking at his looks, we can only say – Yes! 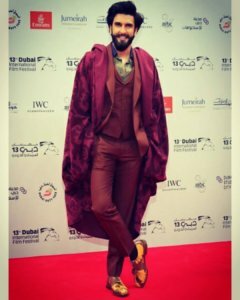 You right Ranveer- Keep Rocking, as no one else has this thundering sense of fashion – could be better in ruling each look with ease and confidence. He can flaunt in print on print, alien dresses or even in skirts. Its easy to pull off Pleated Dividers, Plazzo’s, psychedelic print and a Rajasthani kurta. Don’t believe me- have a look yourself. Never fails to amuse and command the play of season’s trend. I love him in this red tint suit, completely deserves to be in next Twilight, Harry Potter or GOT saga. 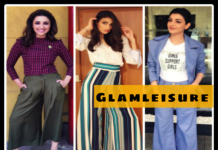 Here we are to decode few of his best quirky and stylish look and some really elegant stylish looks that just gave us a jaw dropping expression. I love the energy, weird expression and a certain aura in each shoot of him. Who can be more rocking with this kinda swag in a checkered elegant suit. Ahh ! Ranveer you never fail. Only our man today can rock in this Super Mario dress with this ease and confidence. 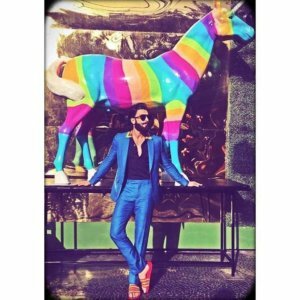 How elegantly he complimented this #Lisa Frank- Unicorn. Bollywood sometimes amuse us with bizarre, but RS takes it to other level to create a new dimension. Prints on Prints on Prints, and look at those winged shoes. 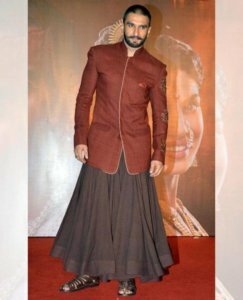 Breaking those stereotypes, He can even slay in pleated skirt and palazzo and don’t forget to notice those gladiators beneath. Look at this quirky blue coat with gladiator sandals and black shades, as if he knows the best way to embark a fashion statement. And here he is in the most ultra modern stylish suits to play in. When attire doesn’t bewilder his face does the magic. 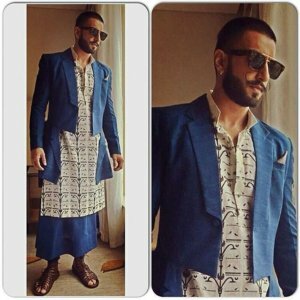 How to complement the each look or spice up a subtle outfit, no one knows better then our Bollywood Lead Actor. He has it all and know to make things work together. But this i cant understand and and only christen it as – Bizzaire. 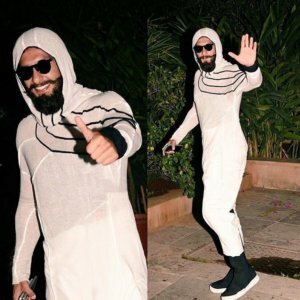 We wonder what made him land in Shahid Kapoor’s birthday bash in these white hoodies paired with those black sneakers and shades in evening. And this asymmetric block abstract design- goes beyond our heads. 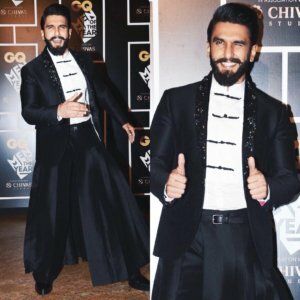 Ranveer Singh Fashion is fresh, bewildering and predictable but then we love his candid smile and eexciting personality and are ready to see more of his playfull looks. – I am Sure you are too.